Guest what? We had a cyclone last night with gale force winds! And right at this moment we are amidst massive flooding after all the rain! Oh, no! I wish you and your neighbors all the best, my dear. I hope you stay safe when that happens. ~hugs~ And thank you for the well wishes! I hope you enjoy the A to Z blog challenge. We get really windy on the California Delta. Sometimes they call it the Delta breeze, but it's way more than a breeze. I love your Spark. 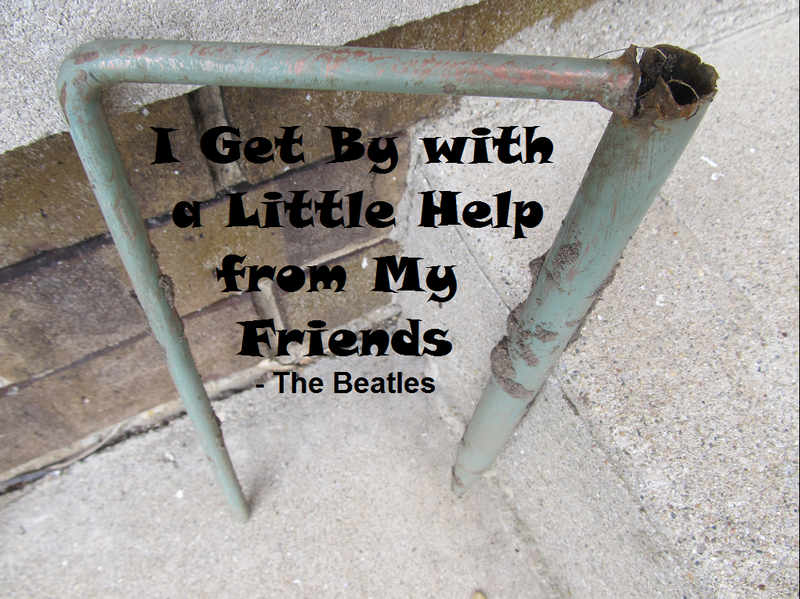 It's a good thing to get a little help from your friends. That's interesting. I never heard of the Delta breeze. Hope your day is lovely, my dear! We did get some heavy winds last week. The weather has been crazy. I think we're in for a windy day tomorrow. BTW, you may wish to update your Gravator Profile to reflect this blog address instead of the WP addy. I always have to go back to Annie's to find my way to your blog. :) Have a pAwesome week and thanks for the visit, my friend! Oh, thank you for the tip! I have no clue what you mean, however. ~shakes head~ I'll see what I can figure out. Be well, my dear! Nice spark and great job fixing the spinner. We do seem to have a lot more windy days lately. Parts of our house keep blowing away! Crazy. Hope you are well! I've known of you for a long time from Strayer's blog. She's an inspiration to me, and I'm well aware that she means a lot to you. I often reflect upon the type of people who tend to get a lot of fame and attention, and I think it says wonders about the public's values that people like Strayer are not among them. Like Strayer, I live in Oregon's Willamette Valley (she in Albany, me in Eugene), and we get gusts of 40-60 fairly often in winter. The Coast is sixty miles from us, and the headlands often get winter winds of from 80-120--these winds lose most of their strength when they encounter the Coast Range. I'm from Mississippi originally, and tornadoes and hurricanes were a big problem there, so they make Oregon look pretty darned good, wind-wise. Thank you for visiting! I am so with you on our dear Strayer deserving fame. ~nods~ I know what you mean about tornadoes. We even had hurricane winds take out our power back when Ike made it inland. Ugh... Be well! Thank you for visiting! I hope you get back to those stories. ~grin~ Be well! That spinner is cool. We get gusting winds a couple times a year (the Santa Anas), but the rest of the time, nope. I'm glad you like the spinner. ~grin~ And I believe I'd like your family. Be well! We're supposed to allegedly get high winds Saturday. On those days, I hold my breath for the maple and hope its branches don't come flying down. I like your wind spinner. Oh, boy, I wish you all the best. I'm so glad you like my spinner and that it hasn't gotten damaged, having been knocked down two times! I had to move it from my original intended spot. ~sigh~ Thanks for stopping by, and doing all you do. Be well and stay safe! Darla, in what region do you reside? I grew up 100 miles from the Gulf of Mexico, so the main effect of hurricanes was that the the air would cool off for a few hours, but I think it was Camille (back in late sixties) that destroyed my father's new double garage by lifting it up, turning it onto its roof and dropping it a hundred feet away.